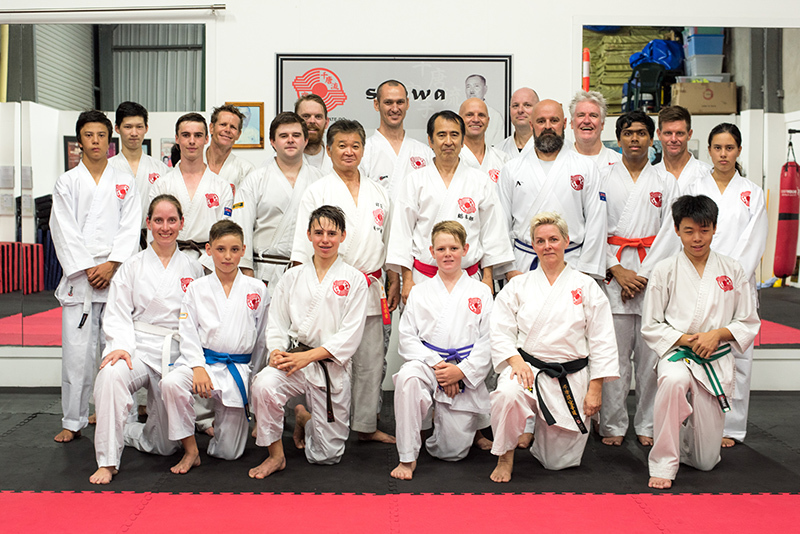 On Wednesday 29 and Thursday 30 November we were fortunate to host Soke Sensei as part of his annual Australian tour. Soke Sensei was accompanied by one of his senior students and master of kobudo Higuchi Kyoshi. Shihan Martin Phillips from the Sunshine Coast dojo also came down for the 2 days of training. In a world were there are lots of different martial arts schools of all different flavours (and new flavours being invented every day) we are very fortunate to have access to the real budo arts through our Chito-Ryu family. To see the benefits of training diligently in a style of karate that has many layers to it, and what can be achieved through years of dedicated training is truly inspirational. To have Soke Sensei visit our dojo and share his knowledge is a true honour. 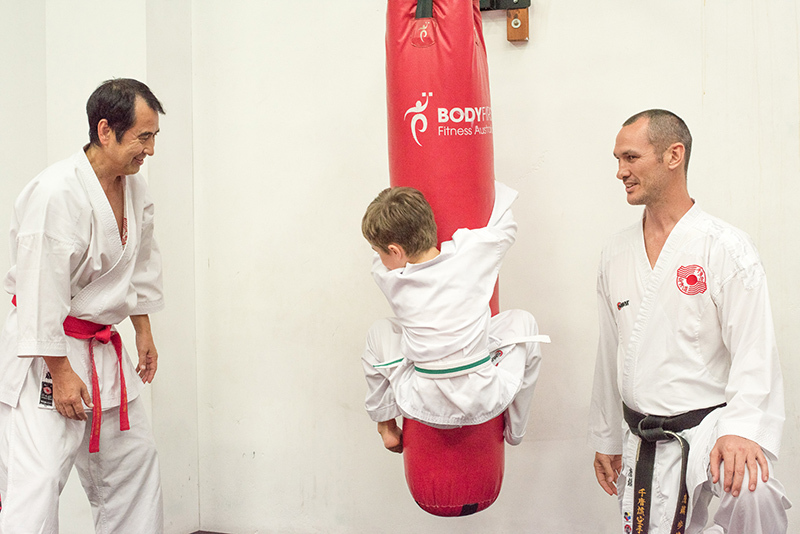 Soke Sensei took the regular classes starting with our Little Champions (4-7yrs) on the Wednesday night. 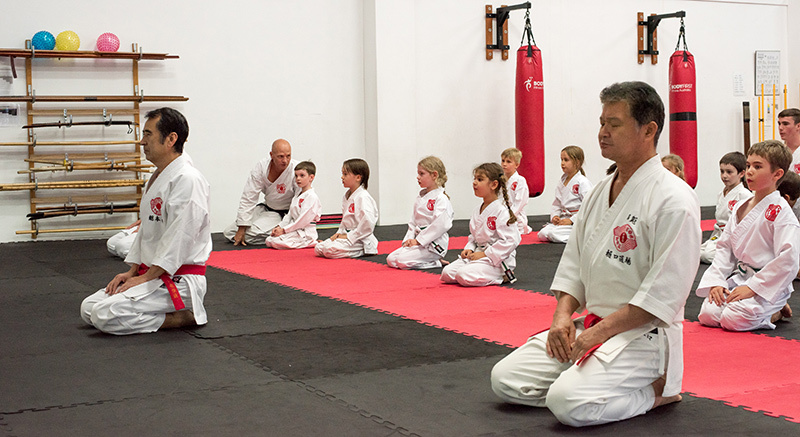 The young kids loved the opportunity to train under Soke Sensei’s guidance and where very eager to show their best. They particularly loved getting to be koalas jumping onto and hanging on the bags. 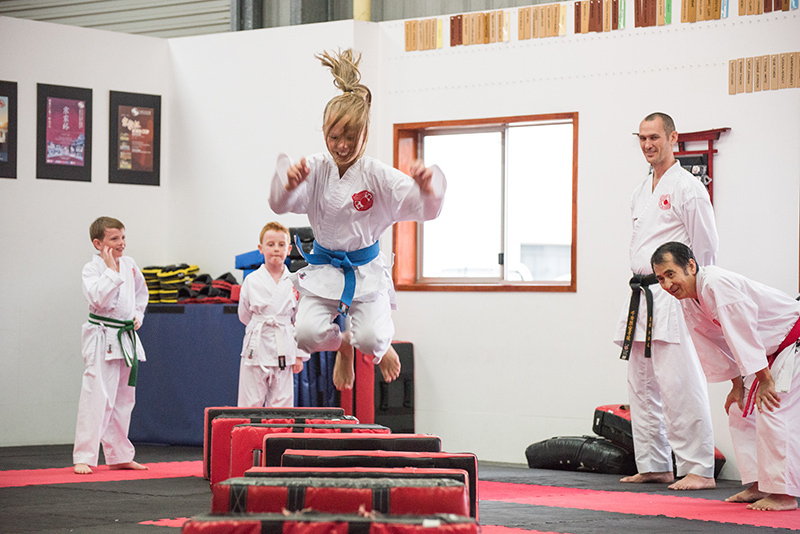 The juniors class (8-11yrs) was a good test of spirit with lots of jumping to make the kids work hard. Soke Sensei had the kids doing lots of jumping. The final class with the seniors was lots of basics and hard work for the first half and then splitting into groups for the second half. The beginners got to work with Soke Sensei which was a great thrill for them, the intermediate levels did some work on kicking with Martin Phillips Shihan, whilst the seniors spent their time with Higuchi Sensei working on kobudo. Thursday night saw some good numbers of keen kids in the first class which was a combination of the Little Champions and the Juniors. 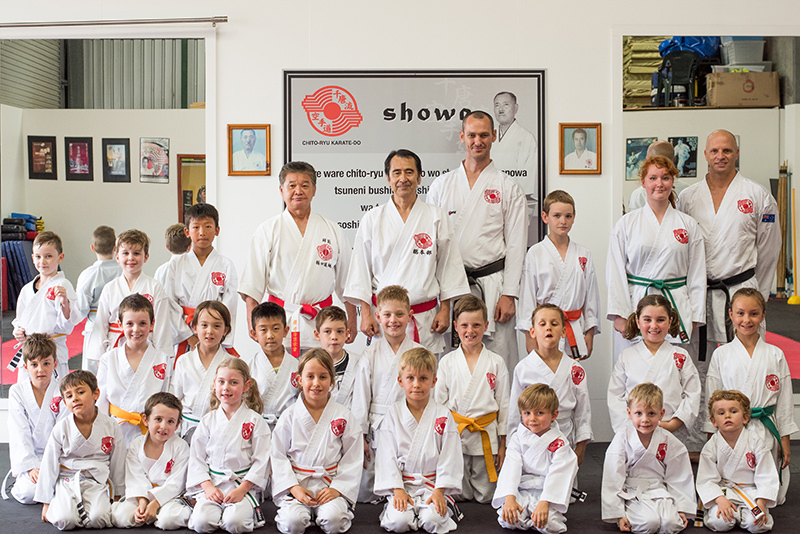 Once again the kids were keen to impress Soke Sensei with their attitude and karate. The second class was a special kobudo class for 1st kyu and above with Higuchi Sensei. Higuchi Sensei has a great way of teaching where he is very encouraging and adds layers to your technique as your confidence grows. His enthusiasm is contagious and the 50 minute session went very quickly. Bo training under the watchful eye of Higuchi Sensei. The final session was again another good hard workout with lots of basics finishing with a run through all the kata up to Sanchin. 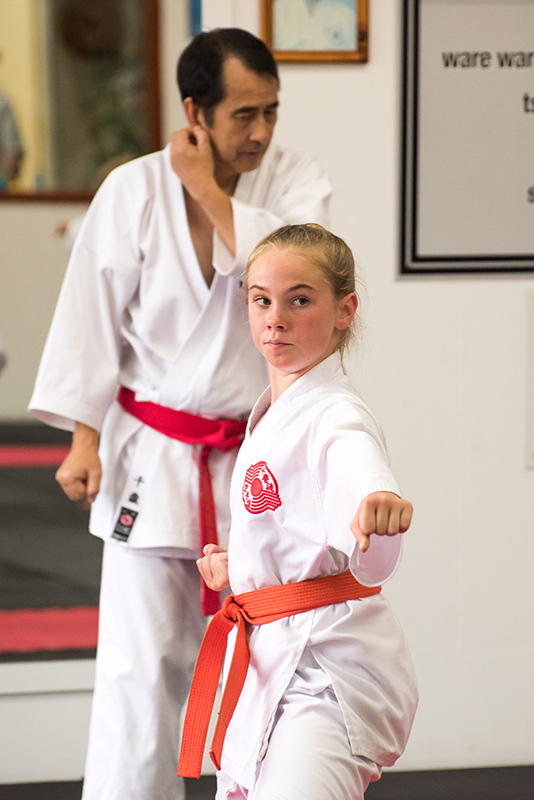 For many of the students it was the first time they had seen some of these kata and the first time they had seen a karateka of Higuchi Sensei’s level perform kata. After speaking to some of the students afterwards they said it was a very impressive sight. The other observation from some of the senior students was how they could see the clear progression in technique from Sensei Adam to Phillips Shihan to Higuchi Kyoshi. Once again the depth of knowledge in Chito-Ryu Karate and the benefits of years of dedicated training was evident. Interestingly when some of the senior students remarked to Higuchi Sensei how impressed they were with his technique, Higuchi Sensei just shook his head and pointed to Soke Sensei indicating that he has some ways to go to reach Soke Sensei’s level. 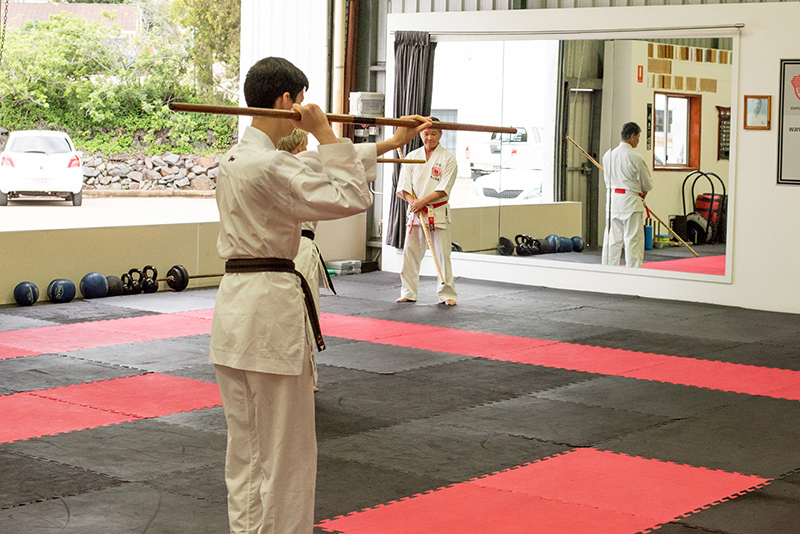 The second half of the final session had Sensei Martin, Sensei Adam, Senpai Monica and Kazumi continue to work on weapons, this time with the sai. The remainder of the group continued to work very hard with lots of jumping kicks and kumite drills. There were some very sweaty bodies by the time the class ended. An enjoyable dinner with our special guests to finish their trip to the Gold Coast. Soke Sensei discussed a little about the different paths of karate being sports karate and real karate. He discussed the secrets contained within kata and how when the student is ready to seriously study kata and real karate they will move away from the sports karate side of things (thanks Kazumi for helping translate). I felt we only scrapped the surface of the conversation and it is one I would like to continue at a future date. The end of enjoyable few days of training leaving us all with lots to think about and work on, plus lots of inspiration to continue our studies of Chito-Ryu Karate-Do. 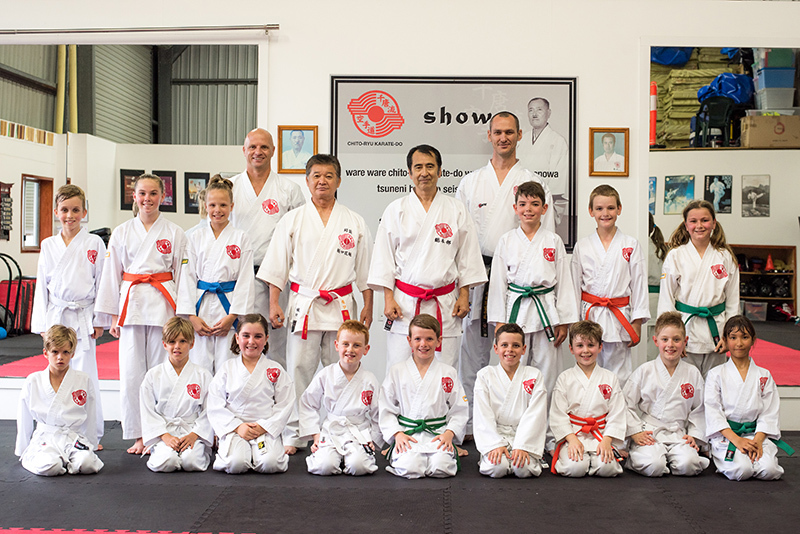 Thank you to the GC Chito-Ryu Karate Club Inc. who financed Soke Sensei’s visit to the dojo. 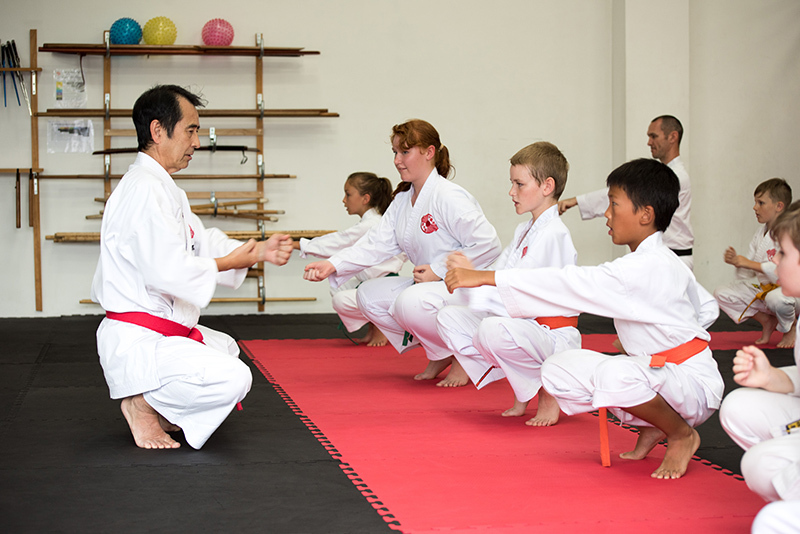 As always it is a great investment in to the future of Chito-Ryu Karate-Do on the Gold Coast.